Order from Amazon. Visit the companion web site. 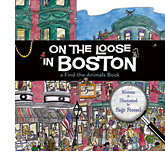 With simple rhymes and colorful, highly detailed images, cartoonist Sage Stossel creates a "Where's Waldo? 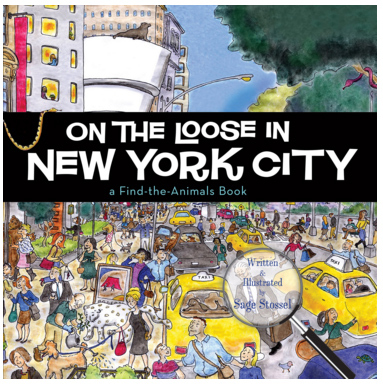 "-style hit, setting animals free from Franklin Park Zoo and challenging children to find them in settings from Faneuil Hall, to the Esplanade, to Fenway Park. Children will have a ball helping the keeper find a rhinoceros in the North End, a koala bear in Chinatown, and a penguin on Boston Common. Over 100 animals are hiding cleverly in beloved Beantown settings.